Frank Harden is man on the run. With time running out, Frank must find his redemption before it is too late. Can one act justify a lifetime of wickedness? Explore the darkest confines of the soul from upcoming director Robert Conway's film, "Redemption." A genre busting Western where there is no law, no good guys; only the bad and worse. Frank Harden is no stranger to the unlawful west, he is a killer. However, because of a tragic event he must battle his own worst enemy, himself. Frank Harden is man on the run. With time running out, Frank must find his redemption before it is too late. I am not knocking Netflix but one of the reasons I keep the old school service of renting DVD's is so I can access movies that don't seem to be available from other sources. That in mind, I am prepared to see a lot of movies that that I probably would not see from anywhere else not even on cable. Redemption is better than a lot of the westerns that I get to see through this service. The sets, costuming, and acting are pretty good. I am only disappointed by two things: when it was supposed to be dark, it was too dark to see anything. Also, not to appear morbid, no one explained why the dead woman was tied to a stake in the street. Good job on a very limited budget. This may actually be the worst one I've ever seen, and among the worst movies I've seen in general. Where do I even begin? The acting was horrible (can you say overacting? ), the plot was weak and the dialog sucked. And don't even get me started on the accents. I felt like I was watching a first semester community college acting class. 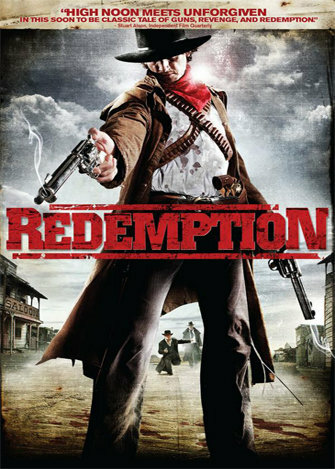 For those who actually thought this was a really good Western, I can only assume that you don't rent a lot of good ones. The only good thing I could find about this movie was the fact that it was so terrible, it was actually funny, although I'm sure that's not what the director was going for.